We splashed out and chartered this limo to get to our hotel from the airport. 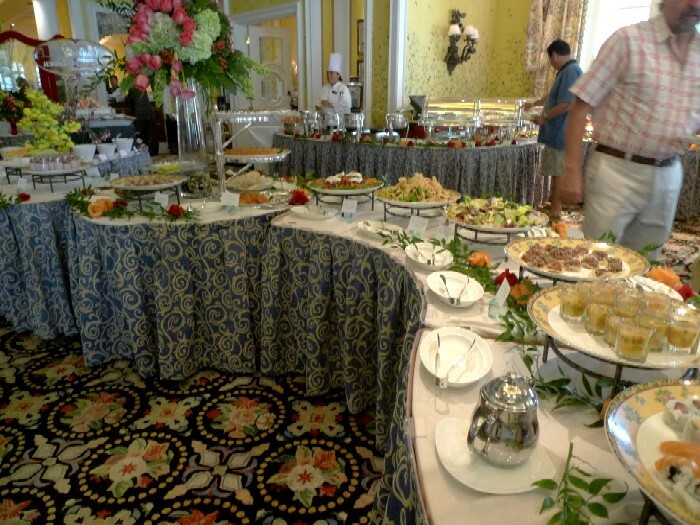 We enjoyed a buffet dinner, took a stroll through the streets, and had a champagne brunch. We are having grand days! 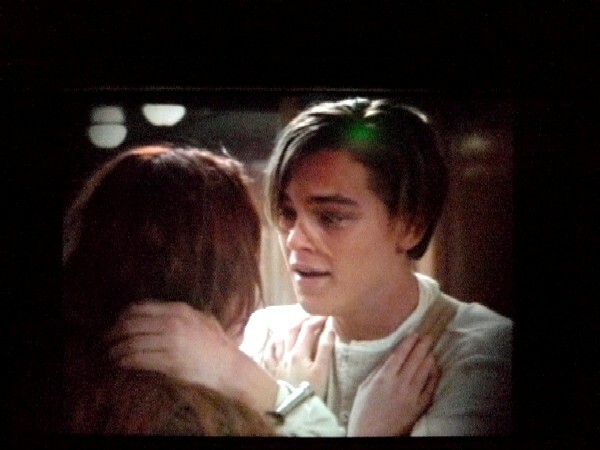 Watching Titanic, I was heading to LA. It was the first time to see it though there was plenty of opportunity. The movie should be shortened. 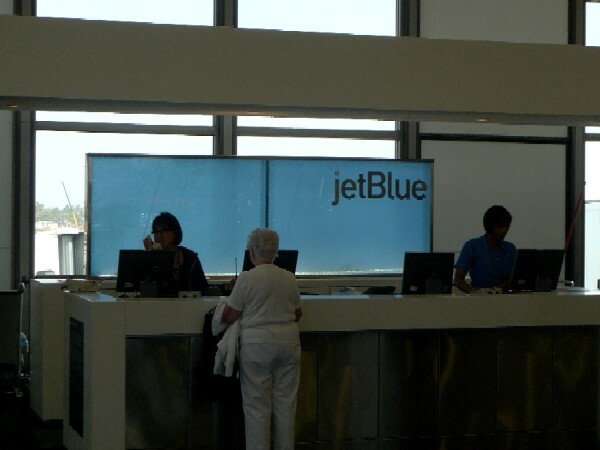 From LA, I took Jetblue Airlines' flight. I’ve arrived in Boston to begin an eleven-day visit to the US. Despite the long journey, I was in fine shape when I got to the hotel, so I went to a neighborhood bar the hotel reception staff recommend. As you may know, Japanese women's national soccer team won the World Cup! 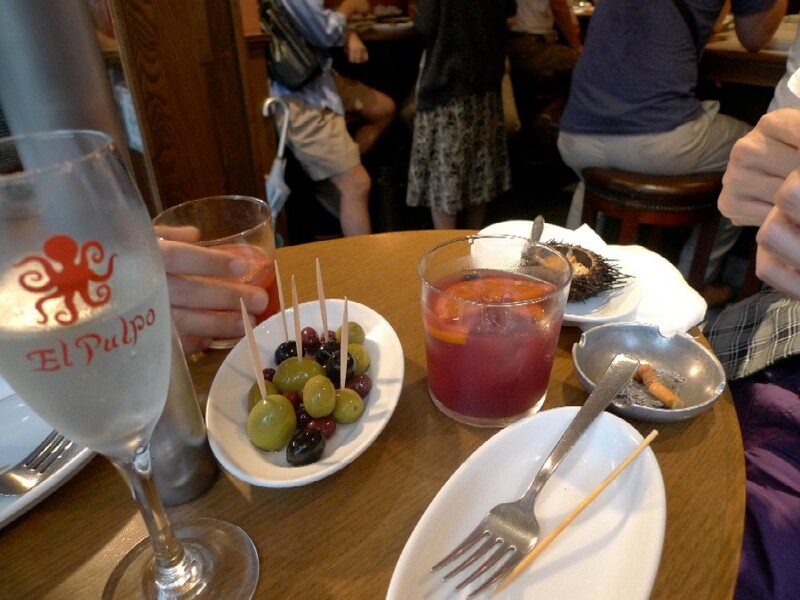 Rubbing my sleepy eyes, I went for a drink at a Spanish Tapas Bar named El Pulpo yesterday. 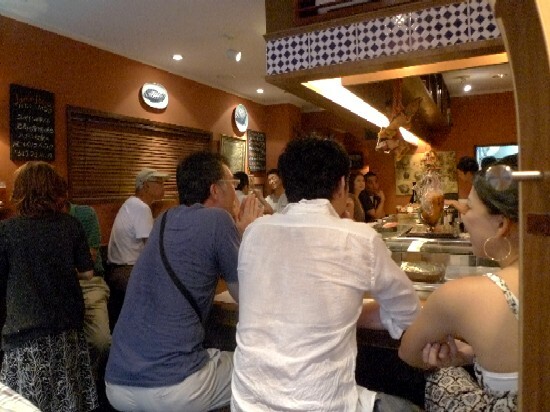 El Pulpo is one of popular restaurants in Kagurazaka (神楽坂, is a neighbourhood in Tokyo, near Iidabashi Station). Tomorrow, I’m going to leave for Boston in which I have something to do. 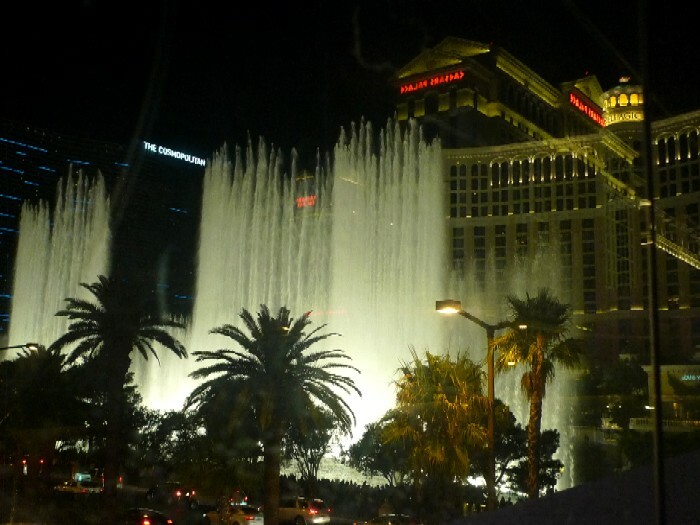 After staying there for few days, I’ll join my friends in LA and then head to Las Vegas! 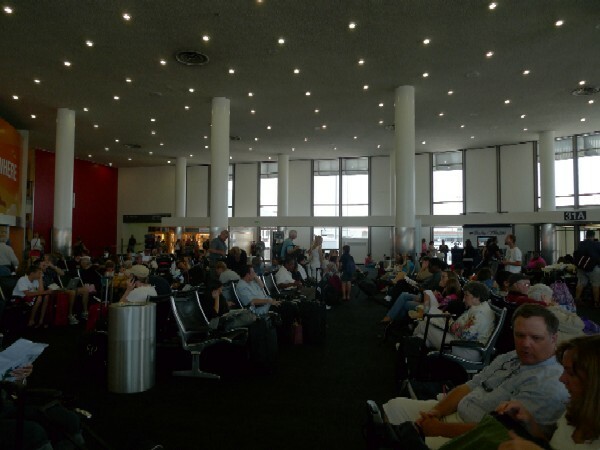 I’m going to update the blog in the US. 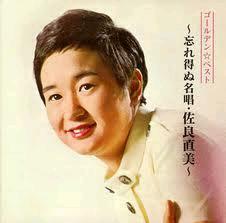 She is a Japanese singer who was active from the late-1960s until the mid-1980s. After she left singing, she ran her family's company and now manages a dog training school in Nasu, Tochigi Prefecture. It seems I was a big fan of her when I was 3 or 4 years old. I don’t remember about it, but my mother used to say so. I heard, one day, I went to a beauty shop next to my house alone and cut my hair like her without my parent’s permission. I'll ever know why I chose her, not a young idol singer. Coming into the '80s, the singer was staying behind the scene, so, I didn’t have time to listen to her singing and just vaguely remembered her voice until a while ago. Now, I sometimes enjoy her voice on a video site. I supposedly heard these songs for the first time on the site. She was indeed amazing. I’m happy because the videos demonstrate that infant Kinakinw had a good eye for singers. Last year, she released new songs for the first time in over two decades and participated in the interview by a tabloid newspaper. 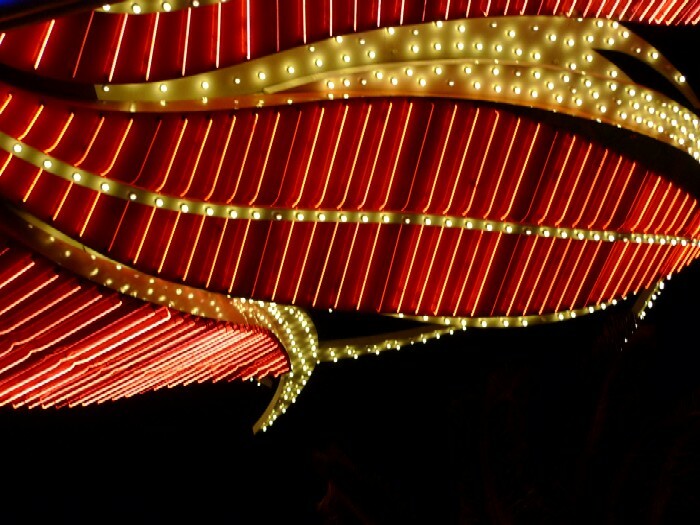 When a celebrity fades from the limelight, we are inclined to suppose that person would go down in the world though he or she wants to be center of the stage. The interview tells us that are totally silly assumptions. She’s just doing what she wants. However, I wish we could share her gifted voice. I was in an electronics retail store in Yurakucho (有楽町, a neighborhood of Chiyoda, Tokyo, situated in between the Ginza and Hibiya Park) last Wednesday to buy a TV with my sister and cousin. While we were waiting a sales assistant who handled paperwork, I remove a SD card from my camera and put it into my camera, LX3, for some reasons. At that moment, my sister noticed that a tiny piece of plastic fell on the floor. Most likely the piece was from the SD card. So I tried to remove it again for confirmation but couldn’t do it because something caught the card. I was too scared to pull it with brute force, so after we paid the bill, I took my precious camera to a repair section of the store. I was glad to be the store that was originally a camera shop. However, a staff at the repair section said he couldn’t simply remove the card because that might scratch inside of it and suggested me to send the whole unit in for repair. Well, it coasted 8,400yen (about $100) at the minimum, but it was less of a problem, with the cost, but with how long repairs would take it was important consideration. I’m going to go to the states from next Wednesday ant want to bring it. The staff said that the repair would take more than ten days. Oh, No…. 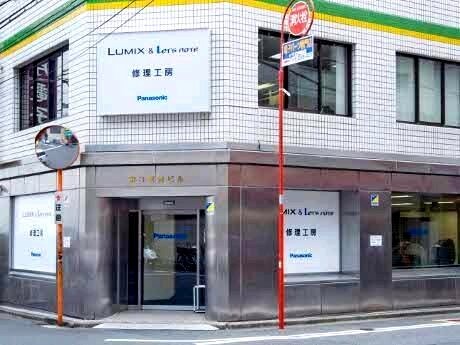 I asked him if there was a way I could resolve the problem as quickly as possible, and he told me about a repair station of Panasonic into which Lumix (Panasonic's digital camera) and Let's note (Panasonic's note PC) users could bring the camera. The repair station was in Akihabara, so I headed off to it. In the end, a person of the repair station pulled the card with brute force. That was it. My camera was OK. The parson didn’t charge for that. I thought the servicemen were like a God for me. The repair station takes care a problem immediately! I got all panicky about nothing. However, I realized one important thing. I’d better buy a product I want to use for a long time from a company providing good after-sale service. It is comforting to know I can go to the station anytime if I get into a trouble with LX3. There are local restaurants I do not go to on my own. They serve good dishes worth paying. Some have been the talk of mass media, but I don’t want to go to. 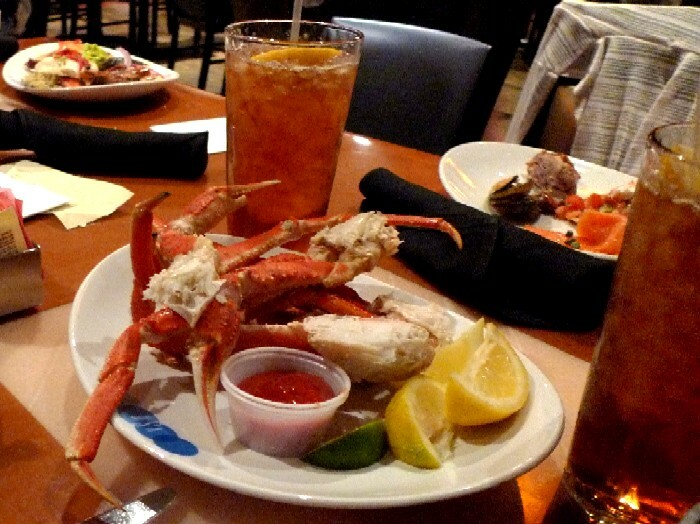 Personally, I care about morals of restaurant, which is sometimes more important than a taste and price of dishes, interior decorating, and attitude toward customers. The first example is a Korean restaurant I avoided visiting because successive shops that took occupancy at the stand-alone house, which was now converted to the restaurant, were a little bit suspicious and shady. However, I tried it once due to an acquaintance of mine who often went to and talked up it. 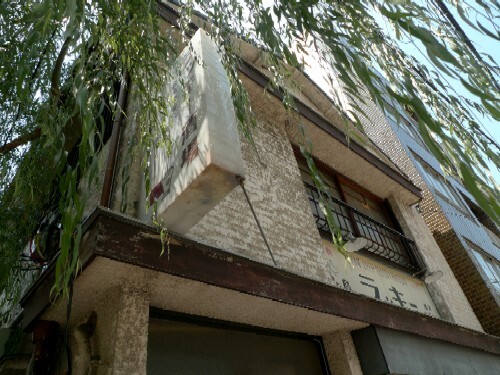 The second one is a retro-flavored Izakaya (居酒屋, a Japanese style pub) that is repeatedly introduced in magazines. 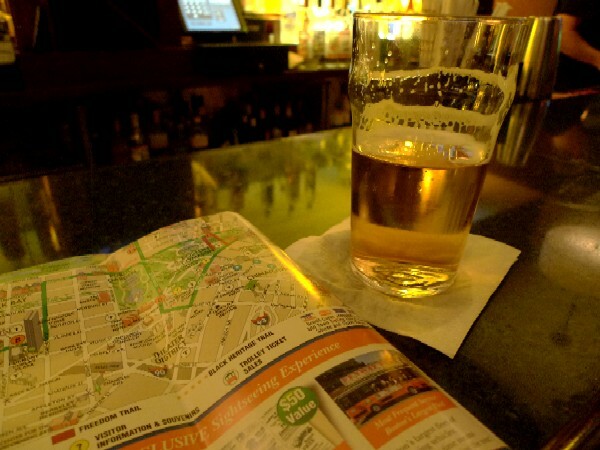 When it opened, I sometime go to it, but now I do not choose it as the drinking destination. The problem is that the pub dirties the sidewalks in front of the pub. After a while of the opening, I noticed the smear of oil on the sidewalks where its kitchen door stands, and I suspected the kitchen staff put dirty water on the street. 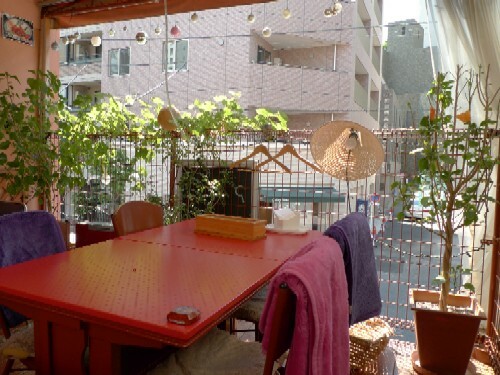 My impression was that a stranger came to a town one day, opened the fashionable Izakaya owing to the town’s atmosphere and dirtied that town. I think the details show the shop. If you visited these restaurants from other cities, you wouldn’t realize the problems, but if you’re living in the same town, you can't avoid seeing qualities of owners and staff of restaurants. 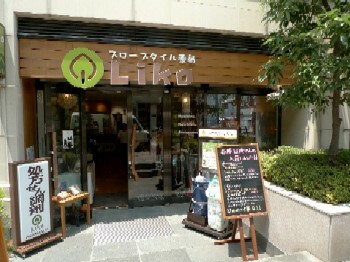 This LOHAS-style dispensing pharmacy named Liko opened few years ago in Azabu-juban (麻布十番, a nearby shopping street in Minato-ku, Tokyo). It’s really unusual and conspicuous compared to other dispensing pharmacies with a plain interior sounding like a part of hospitals. 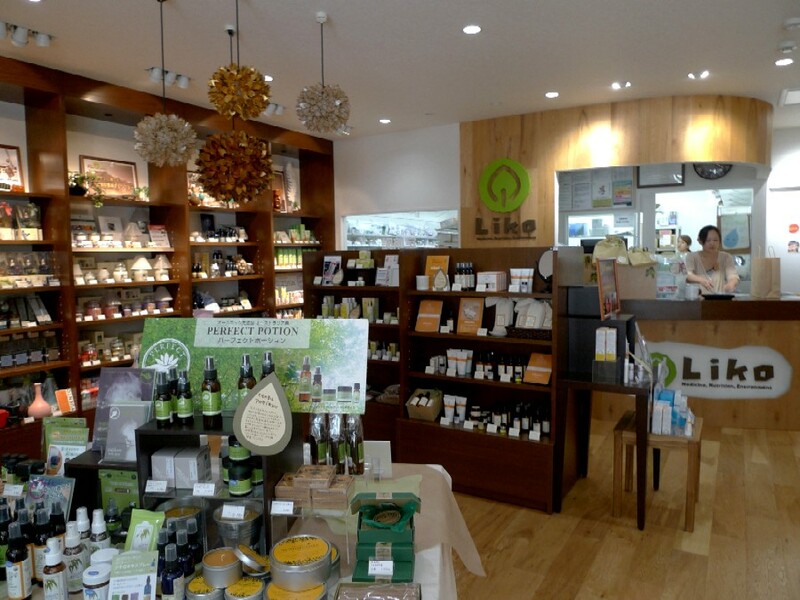 Other than prescription only medicine, the pharmacy sells essential oils, organic beauty products, organic clothing, slow goods, and so on and has a café. When I first walked past it, I thought naturally it was an organic goods' store. I didn’t use it because I felt it was somewhat dubious as a pharmacy due to its business category: why the organic believer sells medicinal chemicals? 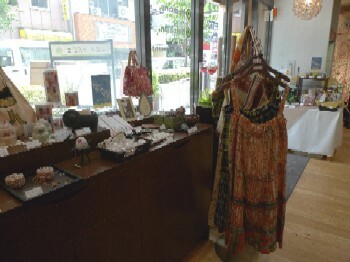 In addition, the staff say “welcome to Liko” when a customer go into the shop. Isn’t it strange? I found out later it was a sister shop of a trustworthy dispensing pharmacy nearby, so I used it once the other day. Well, setting aside the question of LOHAS theme, it was quite nice, and I visited it today. The staff is friendly and kind. It isn’t crowded relative to the other one, so I can receive medicine earlier. It would be my family pharmacy. In Japan, general drug stores selling nonprescription drugs and dispensing pharmacies selling prescription only medicine are segregated over the ages. While we could easily find the former on a street corner, before, the latter was mainly located near hospital. Japanese doctors now switch from writing an in-hospital prescription to writing one with which patients can get medicine at any dispensing pharmacy, so new shops, including this unusual one, opened throughout the town these years. I encountered a Higasa (日傘, a parasol) boy yesterday! 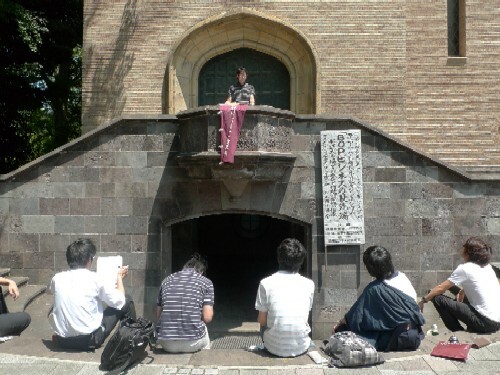 While many Japanese women, including me, use a parasol during the summer, there aren't many men like him. 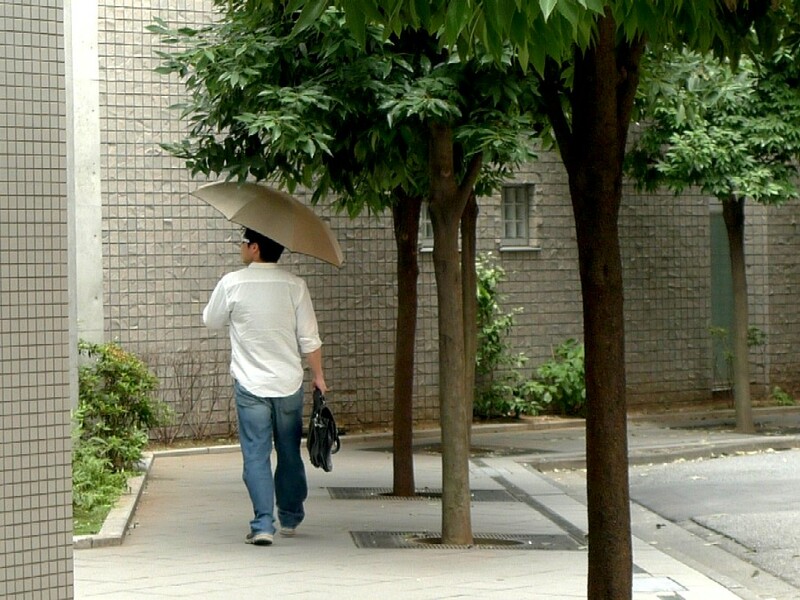 I had never seen any gentleman opening a parasol on the street, although a men’s parasol and its users has been the talk of mass media on and off for the last few years in Japan. It’s somewhat cooler under a parasol. 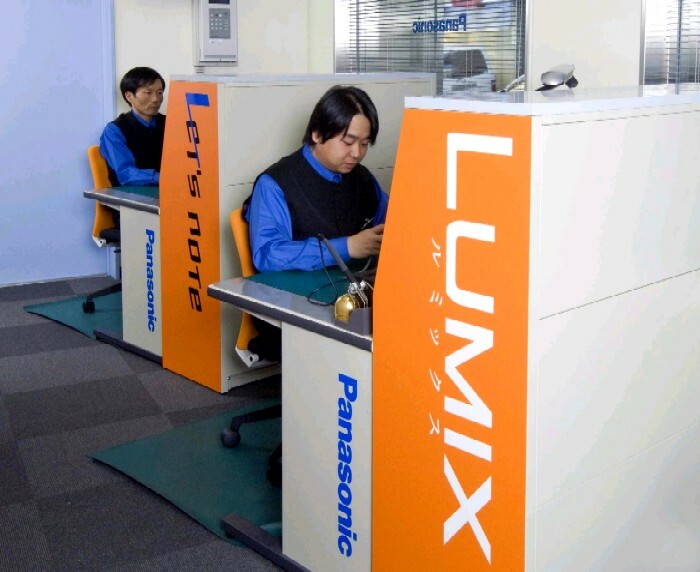 This summer, businessmen need to keep cool when outdoors. When they get back to one's office, it’s hot, too because many companies set the temperature of air conditioners higher due to energy saving. Also a parasol is useful for not only men who are careful of one's skin but also those who are allergic to UV rays, so it isn’t surprising that men want to put it up. I hope many gentlemen can proudly open it without hesitation for defending oneself from the murderous sunlight. I see Western women opening a parasol in Azabu now. I want them to keep that custom after returning back to their countries, so that a parasol on the street becomes widespread. Then, if I use it in their countries, Westerners who are intolerant in it wouldn’t look at me weirdly and make me edgy any more. What will happen after this nightmare? What do you think this boy is doing under the scorching sun? 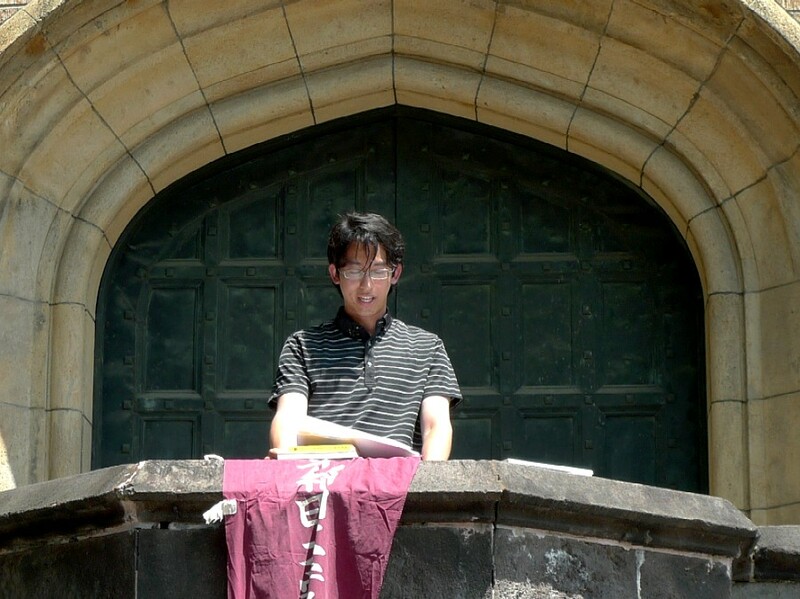 He is a member of a traditional oration circle at a university and trained in public speaking. The circle produces a lot of famous politicians including five former prime ministers. Supposedly, some of them are would-be politician. I think I didn’t heard positive news about Japanese politics over the past decade. However, it's hard to believe our political condition become what it is today: worse comes to worst. What will Japan be like when these boys go out into the political world?